Drop what you’re doing and make your plans now to attend Gay Bowl XVI. Traditionally held over the Columbus Day holiday weekend, this year it runs from October 7-9. 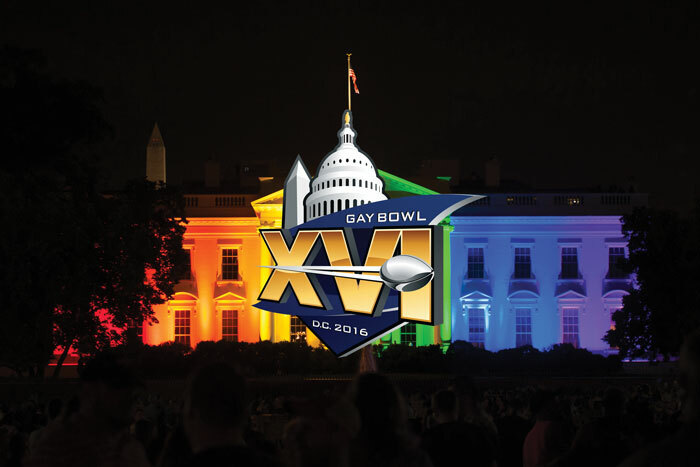 For the second time in the NGFFL’s history, the Gay Bowl is being held in Washington, D.C. which is not only the nation’s capital, it’s also a capital place for gay sports. The host committee and board of directors for the DC Gay Flag Football League (DCGFFL) are excited to welcome you to their hometown and you won’t want to miss the competition. In fact, they’ve created a fun video outlining all the reasons to come – you don’t want to miss it either. It’s on their website at gaybowl.org. This year’s tournament features teams participating in three divisions: Open A, Open B and the Women’s division. But much of the excitement is centered on which team, if any, can beat the San Diego Bolts. There have been many teams who have claimed dominance over the past 16 years – the Washington Monuments won two years in a row; the LA Motion won two years in a row – twice; the New York Warriors won three years in a row; and then the Bolts came along. They’ve won the last four championships in a row and you can be sure there are lots of teams just waiting to break that winning streak. While there are lots of great playing fields in the greater D.C. area, this year the games will be played on the National Mall – how cool is that. According to the DCGFFL, “With the scenery of the Washington Monument, the Lincoln Memorial, and the Capitol building all in view, you’ll get to experience some of DC’s most breathtaking sights all while you run routes and defend passes.” Score one for the DCGFFL! Host hotel is the Washington Hilton with a special room rate as well as discounted parking. And if you’ve ever lived or visited in D.C., you know parking is a hassle. In fact, their website offers great directions from Ronald Reagan National Airport, by car, Metro, or using Uber, taxi or bike share in the area to get to and from the hotel and fields. See you next month in D.C.